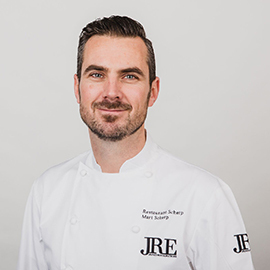 Discover the 14 famous guests Chefs from all over the Europe from JRE Association that will be cooking at Diamonds Star of the East from January to April 2019 and in July and August 2019. 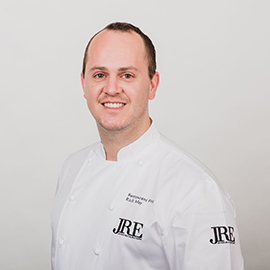 JRE Chefs combine extraordinary talent, a deep passion for cuisine, a love of local produce, and a strong sense of tradition. Their cooking expertise paired with the outstanding atmosphere of their restaurants offers a truly incredible experience. Each Chef, each week will delight guests with Gourmet Gala Dinner, Show Cooking, Four-Hands Dinner and Cooking Class. He opened his own restaurant Scherp, located in the historic center of Middelburg. The cooking style is refined and tasteful, with great attention to fresh fish and local products. 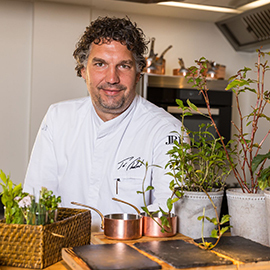 In his kitchen he has privileged to have beautiful regional products in Zeeland and with a lot of love and passion he incorporates these into his tasteful dishes. After studying philosophy and law, Allan turned to cooking, which has been his passion since childhood. With a Picard grandmother and another Spanish he has, since his youngest age, juggled between different gastronomic cultures. After he ended his education by Michelin star chefs, as Alléno Mille and Dutournier Moisand, he moved back to his hometown to start working in his family restaurant Le Senso in Beauvais. 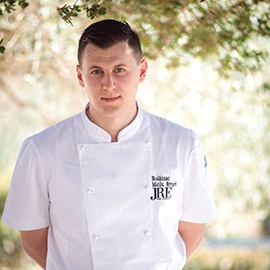 The young chef from Zagreb did an internship in 3* Michelin starred restaurant Azurmendi in Spain and then in De Librije in Netherlands, also a 3* Michelin starred restaurant. 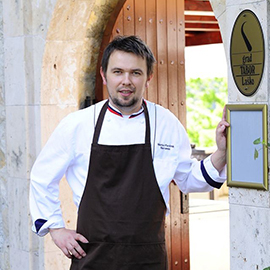 Now he is the executive chef of the restaurant Boškinac, where he works with local ingredients and where each meal pays homage to the gastronomical heritage and bountiful offer of fish, lamb, cheese, prosciutto and other fresh seasonal raw materials. 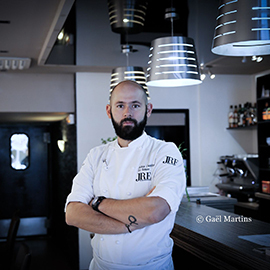 Always dreamed of having his own restaurant, he opened in 2011 Pavus, now one of the most exciting dining destinations in Slovenia, ranked as one of the best 15 by culinary critics. The Pavus Restaurant, situated in a small castle that stands on a hill top overlooking the spa town of Laško, also known for the largest beer brewery in Slovenia, presents a local, seasonal, creative cuisine. The country star chef Daniel Schmidthaler is managing the Hotel & Restaurant Alte Schule Fürstenhagen, where, he places value on high-quality ingredients as a basis for his culinary delights: fine creations from wild domestic hunting ground, freshly caught fish of the Lake District, exquisite wild mushroom and natural herb varieties as well as fresh fruit and vegetables in an ecological garden quality highlight his renowned Michelin-starred restaurant. With his recent ‘three toque’ rating, Hubert has ascended into the elite league of Austria’s top chefs. Inspired by the Alpine region between lake and sea, his cuisine captivates with the lightness of his dishes, offering an exquisite Alps-Adriatic experience. His sensitive creations are born by the combination of high-quality staples and extraordinary ideas. His restaurant, Saag, with its magical waterfront location, it is one of the most fashionable locations on Lake Wörthersee. The classic French cooking is the foundation of his cooking style, but much of his inspiration he get from other world cuisines. 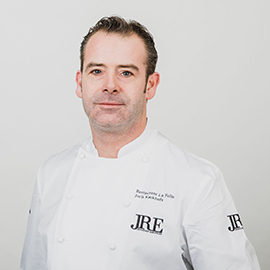 His cooking style is therefore best described as a light French cuisine with an important role in the contemporary cooking techniques and products from international and Asian cuisine. 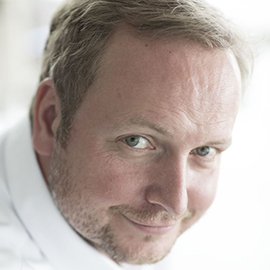 He is the chef and owner of La Folie restaurant, located in a charming historic building in the beautiful river on the Waal, in the fortress town of Zaltbommel. 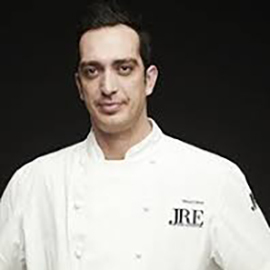 In the process of graduating from the conservatory, Enrico discovered a great passion for refined food and wines. 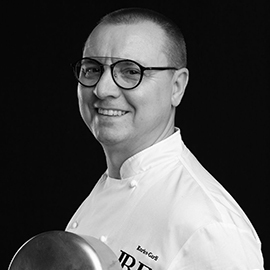 He own the Michelin starred restaurant I Castagni, located in the countryside of Vigevano, in a rustic and elegant farmhouse renovated with refinement by the chef. His dishes are firmly linked to the tradition of the Lombard territory, a strong point for a reinterpretation that rewards the chef’s research and creativity. Giovani has developed a unique gourmet style. Variety, quality, perfection and friendliness are his credo. As Limburger, Giovani puts a love of the day for the use of local products. This Belgian and Limburg delights he handled with attention to detail to healthy seasonal dishes. His restaurant Vous le Vous, located in the rural district Wimmerdingen in Hasselt, combines rural tranquility with culinary pleasure and helps you to escape the hustle and bustle of every day. 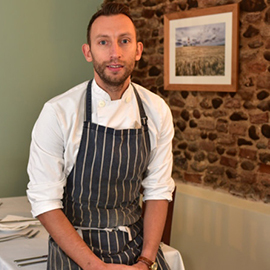 Mark Dixon is Norfolk Chef of the year and finalist in the Academy of Culinary arts and takes great pride in his kitchen serving the freshest ingredients, creating seasonal dishes and using all that is great and good from the local area. He has travelled much of the world but has found himself in his home county. 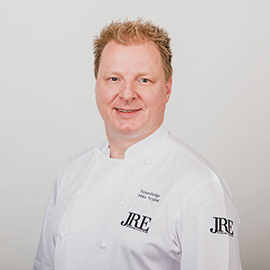 At his restaurant The Kings Arms Flegg he has a fantastic team of chefs behind him and is constantly working on new ideas, pushing their culinary talents. The motto of chef and owner of the Michelin starred restaurant Strandlodge is ‘Think Global Eat Local’. His cuisine is all about the overall experience: on moments where wine-food combinations are right, that’s when he create memories for his guest. In his restaurant, located in a pavilion and also National Monument at the Winterswijkse Badweg, he offersan international cuisine, combining various flavours with the most beautiful local products. 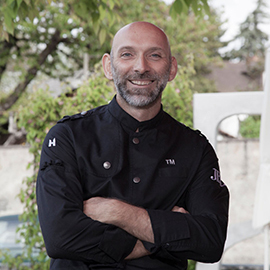 His cooking philosophy comes from his father, who opened the restaurant San Martino in 1969. With his brother, he brought it to the now muffled excellence, enriching the proposal through the enthusiasm and the search for the comparison with the new expectations of the customers. A restaurant, a family, a tradition, where flavors, colors, textures, traditional and creative cuisine relies on high-quality products enhanced by passion and enthusiasm. 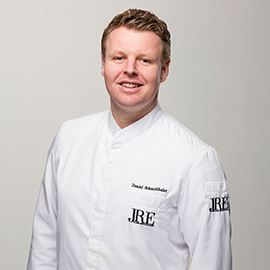 After the CSHG hotel school in Spain, he continued his education in four renowned restaurants in Paris and in Burgundy: the Mariott Champs Elysees, the SYDR restaurant, the restaurant of the Westminster Hotel Céladon and the Espérance restaurant of Marc Meneau (two Michelin stars). Later, as a chef at the Tanao Ando restaurant at the Château Lacoste, he revisits the dishes of French gastronomy, made of fresh and seasonal products, and gives them a Provencal accent. The next step for him is precise: open his own restaurant and let his creativity flourish. The young chef has a marked creative spirit, well represented in his cuisine, well rooted in the territory, with contemporary leaps that enhance the artisan raw material. His Osteria Fernanda, that respects the concept of a modern bistronomic restaurant, enhancing the craftsmanship of the author’s cuisine, is now one of the most interesting contemporary bistros in Rome. 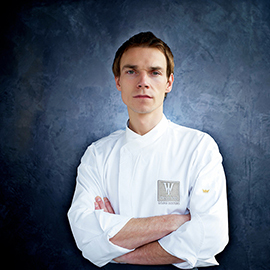 He is one of the major shooting stars of the Austrian gourmet scene. 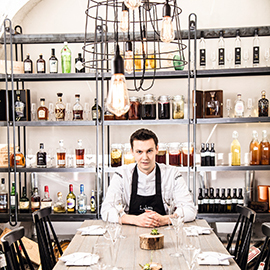 The success of his Lukas Restaurant, located in the historic center of Schärding, is guaranteed by the effective combination of creative cooking, professional yet youthfully-fresh service and a thoroughly cozy atmosphere. Here there is no printed menu, his surprise menus are individually tailored, whilst naturalness, seasonality, innovation and intensity of flavor are the unifying credo. For the young creative chef and entrepreneur his profession has become a vocation. 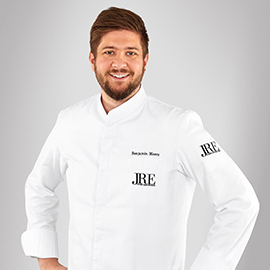 After a long and deep training in the family business, now he is running with passion the Michelin starred restaurant Maerz and Maerz in Baden-Wurttemberg, near Stuttgart. Together with his brother he offers a top gastronomy in a cozy ambience with a guaranteed feel-good factor. The kitchen of Maerz is the perfect culinary combination of home and wanderlust: home-bound and yet cosmopolitan. Thorsten wandered his way through all kinds of gastronomy from good honest home cooking to nouvelle cuisine. 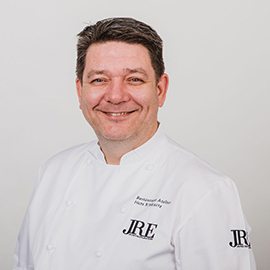 He has been working in Austria’s top restaurants since 1996, in 1999 he received the title Newcomer of the Year by the gourmet guide Gault Millau and in 2008 he received the cook of the year award Gault Millau. At the restaurant Griggeler Stuba at Burg Vital Resort he uses natural finished products, herbs and spices and combine their culinary creativity with precious knowledge of medical science and nutritional science. 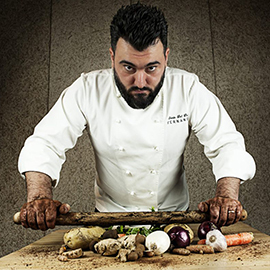 The pure Valais native chef brings his cuisine to life according to the seasons. 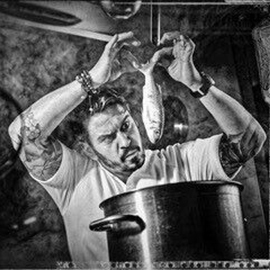 His recipes are born from the encounter with a product and reflect the desire to explore tastes and fragrances, to play with colors and textures. His gastronomic establishment in the heart of Sion is a Michelin starred restaurant and probably belongs to the best restaurants in Valais, both for the chef’s creativity and innovative ideas, and for the superb produce used in his dishes. His restaurant l’Atelier is characterized by surprising dishes in a warm welcoming environment in the heart of the hills of Limburg. He offers a modern, innovative cuisine, with focus on quality dishes and personal attention for every guest. 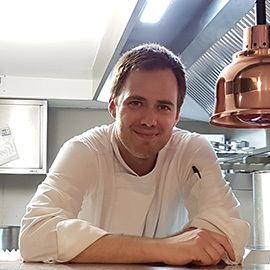 At Merkles Restaurant in Endingen at Kaiserstuhl, Thomas offers his guests a star-studded gourmet cuisine in a relaxed atmosphere of a village restaurant. Merkle’s restaurant is a reliable institution, which proposes a cosmopolitan way of life, a comfortable ambience and the finest culinary delights. His cooking style is inspired by the French-Mediterranean cuisine enriched with culinary interpretations of Dutch cuisine. His restaurant Fris stands for good food in a relaxed atmosphere, offering an authentic cuisine with recognizable quality dishes, using only fresh and organic products.